Since 1980 we have been at the leading edge of RC car racing, producing innovative race winning products. We also make extreme ready to run vehicles for those who just want to drive fast and have fun. Founded in 1978 by Cecil Schumacher who at the time was a successful F1 transmission designer. The first Schumacher product was the ball differential, one of the fundamental items found in almost all RC cars. - 1978 The first ball differential was invented by Cecil Schumacher, an F1 transmission designer. - 1980 Schumacher Racing was started by Cecil Schumacher. - 1982 The first car, the 1/12th scale ‘C’ car was introduced. - 1985 & 1988 Schumacher ‘C’ car wins European championships. - 1986 The CAT 4WD 1/10th scale off road buggy was introduced. - 1987 The CAT, driven by Masami Hirosaka wins the World Championships. - 1988 The first 2WD buggy, the Top CAT was introduced. - 1989 The 4WD ProCAT and 2WD TopCat win the European championships. - 1990 The 4WD ProCAT and 2WD Cougar win the European championships. - 1991 The Nitro 10 range of cars introduced which developed into the Nitro 21 and some of the first ready to run nitro vehicles. - 1994, 95, 96, 97, 4 consecutive European championships for the CAT 4wd buggies. - 1996 The first SST 1/10th electric touring car was introduced. - 1997 to 2006 Schumacher touring cars win 10 USA national titles. - 2001 Cecil’s son Robin Schumacher takes over as Managing Director. - 2002 Fusion range of 80mph nitro cars introduced. - 2003 Menace range of 70mph nitro trucks introduced. - 2005 Mi2 touring car wins the European championships with Teemu Leino. - 2008 Schumacher return to electric off road racing with the revolutionary CAT SX. - 2009 & 2010 The Mi4 touring car wins the British Championships with Chris Grainger. - 2009 Manic twin engined monster truck introduced. - 2009 A modified Schumacher Mi3.5 touring car achieves a Guinness World Record for R/C cars of 161mph. - 2010 Schumacher return to 2WD off road with the ground breaking Cougar SV and promptly win the BRCA Championship with Tom Cockerill. 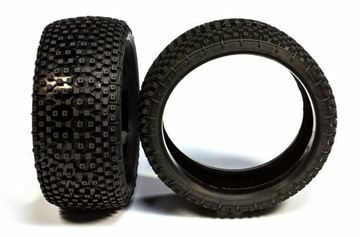 - 2011 Contact tyres launched, and win the 1/8th World and Euro Finals. - 2012 The SupaStox 1/12th range is launched, 30 years since Schumacher last introduced a 1/12th car! - 2013 The awesome CAT K1 and Mi5 launched and SupaStox takes double British Championship title. 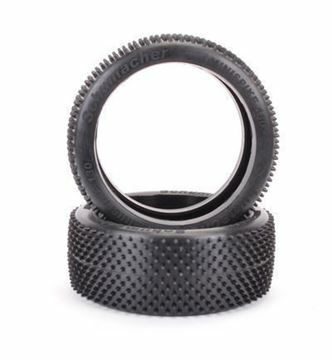 This tyre adds to our range of 1/5th tyres, with this one being 130mm (internal) in diameter for the latest larger diameter wheel. It is available in our most popular Yellow compound suitable for grass and astro surfaces to give maximum grip! The Minispike 130 has been developed to give great grip yet retain excellent life. 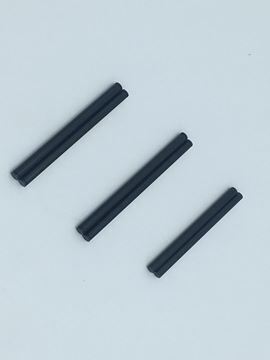 Supplied in pairs without inserts.